376 pages | 10 B/W Illus. This volume provides a cutting-edge exposition to research on the self. Sixteen authoritative overviews highlight the role of the self around four themes. The first theme is Brain and Cognition, which includes a social neuroscience perspective on the self, implicit self-cognition, the structure of the self and autobiographical memory. The next theme is Motivation, in which chapters include social comparison, self-regulation, narcissism, and modesty. The third theme is Self-esteem and Emotions, covered by chapters on the measurement of self-esteem, terror management theory, sociometer theory, and self-conscious emotions. The final theme concerns the Interpersonal, Intergroup and Cultural Context, containing chapters on intimate relationships, social exclusion, the collective self, and culture. Throughout the volume, the exposition is both scholarly and accessible. It also offers critical assessments along with thoughtful discussions of challenges and problems ahead, as well as the generation of novel hypotheses. As such, the book aspires to influence the research agenda for several years to come. 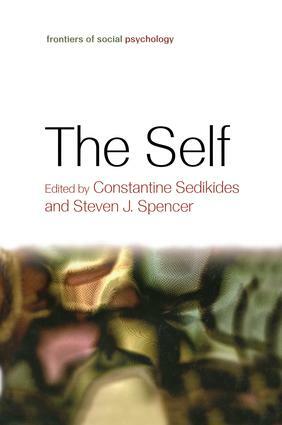 The Self will serve as an essential reference volume for active researchers in the field, while also being appropriate for use as a textbook in advanced courses on the self. Part 1. Brain and Cognition. T. Heatherton, C.N. Macrae, W.M. Kelley, A Social Brain Sciences Approach to Understanding Self. S.L. Koole, T. DeHart, Self-Affection without Self-Reflection: Origins, Models, and Consequences of Implicit Self-Esteem. A.R. McConnell, L.M. Strain, Content and Structure of the Self-Concept. L. Libby, Autobiographical Memory. Part 2. Motivation. P. Lockwood, J. Matthews, The Self as a Social Comparer. W.K. Campbell, J.D. Foster, The Narcissistic Self: Background, the Extended Agency Model, and Ongoing Controversies. K.D. Vohs, B.J. Schmeichel, Self-Regulation: How and Why People Reach (and Fail to Reach) Their Goals. C. Sedikides, A.P. Gregg, C.M. Hart, The Importance of Being Modest. Part 3. Emotions and Self-Esteem. J.L. Tracy, R.W. Robins, Self-Conscious Emotions: Where Self and Emotion Meet. J. Arndt, J. Schimel, C.R. Cox, A Matter of Life and Death: Terror Management and the Existential Relevance of Self-Esteem. G. MacDonald, Self-Esteem: A Human Elaboration of Prehuman Belongingness Motivation. V.S.Y. Kwan, A.N. Mandisodza, Self-Esteem: On the Relation between Conceptualization and Measurement. Part 4. Interpersonal, Intergroup, and Cultural Context. C.L. Carmichael, F.-F. Tsai, S.M. Smith, P.A. Caprariello, H.T. Reis, Self and Intimate Relationships. J.M. Twenge, The Socially Excluded Self. H.S. Kim, D. Ko, Culture and Self-Expression. Constantine Sedikides is Professor of Psychology at the University of Southampton, UK. He received his doctorate from the Ohio State University and has held faculty appointments at the University of Wisconsin-Madison and the University of North Carolina at Chapel Hill. He has published prolifically (and co-edited special books) in the areas of self and identity, affect and motivation, close relationships, intergroup perception, and person perception. Steven J. Spencer is an Associate Professor and Chair of the Social Psychology Division at the University of Waterloo, Canada. He received his doctorate from the University of Michigan and has held faculty positions at the State University of New York at Buffalo and Hope College. He maintains an active research program that investigates self-image maintenance processes, motivated social perception, and stereotyping. He has served his discipline as an associate editor at the Journal of Experimental Social Psychology, and as a consulting editor at the Journal of Personality and Social Psychology, and Self and Identity. He is currently the secretary and chair-elect of the executive committee of the Society for Experimental Social Psychology.